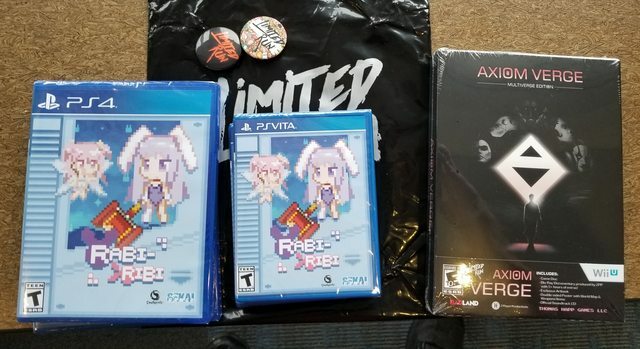 Limited Run Games • View topic - Your latest gaming pick-ups! Re: Your latest gaming pick-ups! I played some minutes to test it, and it looks great! 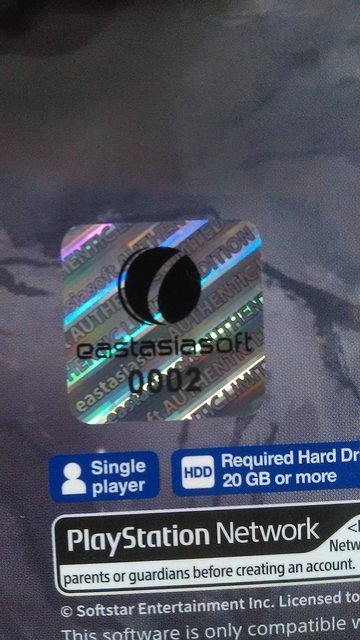 I'm eager to start the game. That manual is nice too. Gott! welch' Dunkel hier! O grauenvolle Stille! Öd' ist es um mich her: Nichts lebet außer mir. Nice! 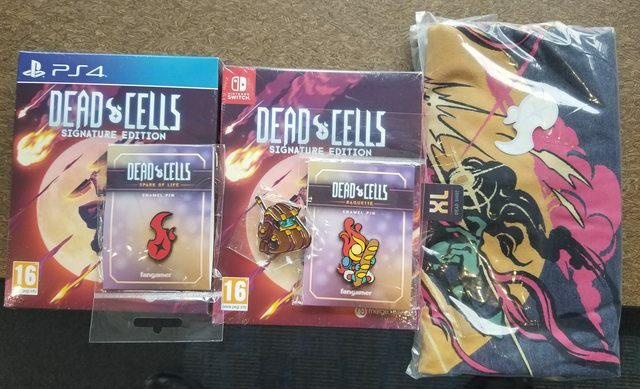 I need to get Dead Cells. This is the first pickup I have posted in a while. Had gotten alot of stuff before this but I really don't feel like going back and trying to get pics (couldn't even remember where I left off from the last time I posted stuff) so I will just start fresh from here. 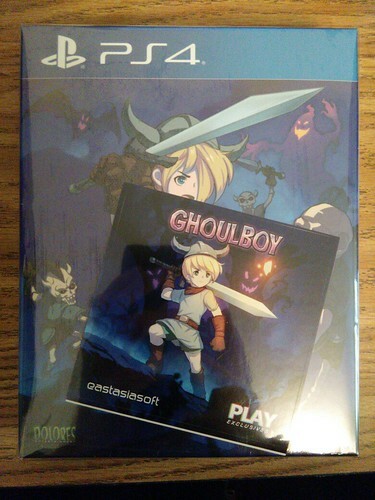 Got Ghoulboy PS4 in the mail today! I got # 0211! BLINXERIZER wrote: This is the first pickup I have posted in a while. Had gotten alot of stuff before this but I really don't feel like going back and trying to get pics (couldn't even remember where I left off from the last time I posted stuff) so I will just start fresh from here. 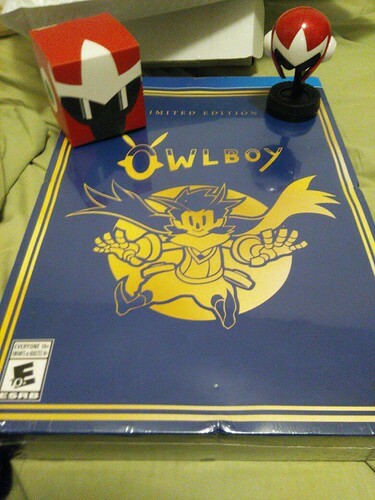 Owlboy PS4 Limited Edition and Proto Man mini helmet. Shame about those big dents. fgsfds100 wrote: Shame about those big dents. Yup... BUT I got it for $30 so I'm ok. Don't want to bother trying to exchange it. Everything else on the inside is fine. Found a Pokemon XD edition GameCube for a dollar. Pretty roughed up cosmetically except for the top emblem which seems to be ok, but I have the preorder bonus GC skins from the XD game I can slap on it to match and cover most of them up. 3 more japanese gamecube games, i already had ohenro-san with the meter but this is the standalone version it was cheap so eh why not not. 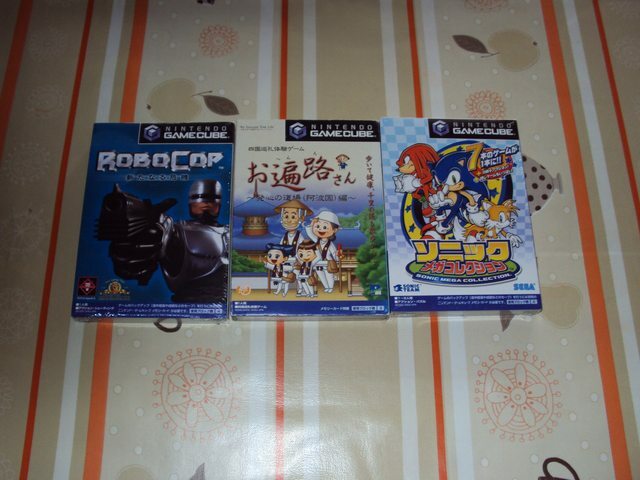 Robocop is one of the rarer jpn gamecube games, been after one for a while but japanese sellers Always want 80-100$+ for them. Just when i was about to gave in, i found a sealed on for 10£ in an english webstore. Sonic collection came from their aswell actually suprised i diden't already had it yet. I think i need 13 games left for a complete jpn gc set. Last edited by kazumn on Wed Apr 17, 2019 4:21 am, edited 1 time in total. 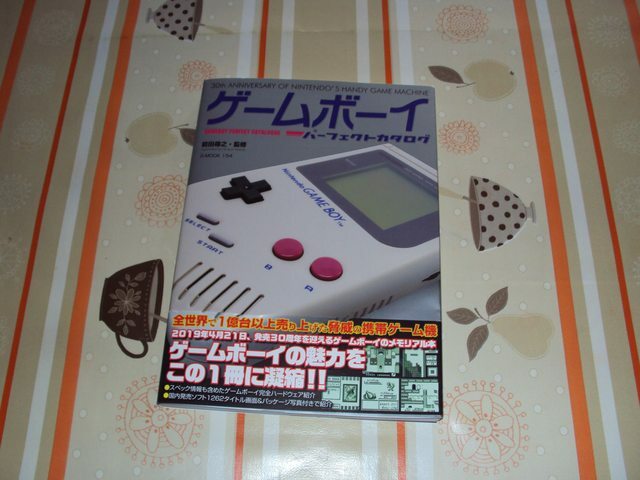 is there a english version of that book about gameboy games? Some cool stuff! 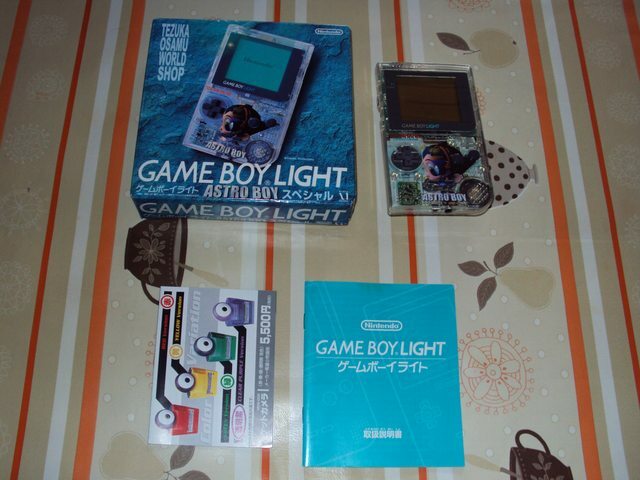 Are you going for a CIB set? Or are you fine with cartridge only? 1232 games sounds like something that takes a lot of space. 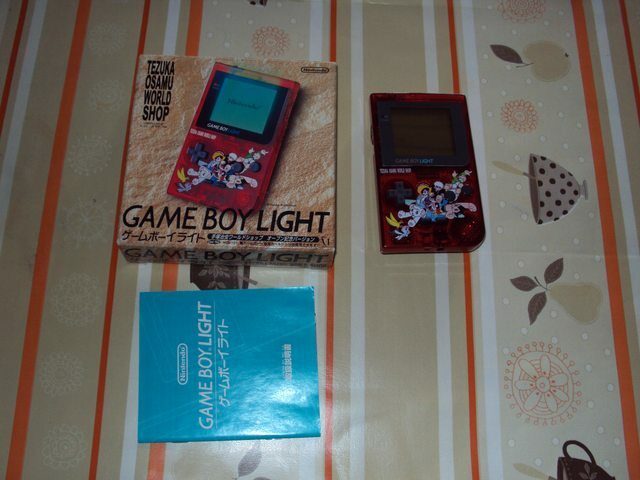 Complete in the box my man that's the way to go, I'm not going after gbc titles tough, just Original black and white ones should be doable with little over 500 titles if i don't get sidetracked too much. and a aqua blue japanese vita without any scratch at all complete with box etc. that was an expensive one luckily I knew the seller and could pay of a bit every month in 1 go I would have never been able to get it. 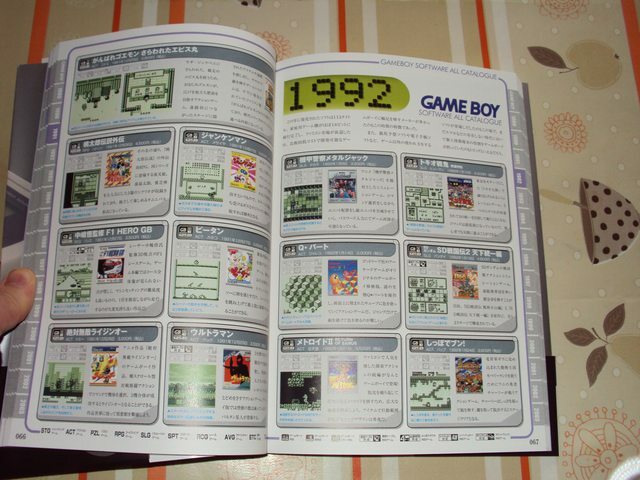 mr. Hyde wrote: is there a english version of that book about gameboy games? Not that i know off as it focusses only on the japanese libary not the english one. kazumn wrote: Complete in the box my man that's the way to go, I'm not going after gbc titles tough, just Original black and white ones should be doable with little over 500 titles if i don't get sidetracked too much. Well, I wish you a smooth journey on that quest. I'm trying to get the complete NGPC NA set (30 CIB + 2 cart only) and it's proven to be more difficult than I thought, because of the casino games. Overall prices are also through the roof, so I'm being patient with what I pick up. Those Tezuka Gameboys are pretty sweet! I've always liked LE systems with characters on them, but for some reason I've literally never bought any. Japan got a heck of a lot more over the years than we have. Maybe when another Switch comes out I'll shoot for an LE, since I haven't gotten the Switch yet. A lot of good stuff there! I need to get back to PSP collecting, really liked that system. I will get back to it in the future as well. stil tons of games to get for it. It's also one of the cheapest systems to collect for as, so many good games can be bought for next to nothing. that outrun coast to coast psp port is def one off the best portable racers out their. So I thought it was interesting enough to post. Pretty nifty! I don't know when they number these or how it relates to orders, and it doesn't really matter, but it's still pretty cool. I mean, number 2? I never expected to get that low of a number. I looked up that game when PA added it. Gameplay seemed to be the typical somewhat dull modern auto-battle stuff, which is okay, but the environment textures looked horrible in the gameplay videos I saw, and I just can't do undubbed dialog-heavy games. Fighting games with some quips between fights in story/arcade mode, okay, but not an RPG. fgsfds100 wrote: I looked up that game when PA added it. Gameplay seemed to be the typical somewhat dull modern auto-battle stuff, which is okay, but the environment textures looked horrible in the gameplay videos I saw, and I just can't do undubbed dialog-heavy games. Fighting games with some quips between fights in story/arcade mode, okay, but not an RPG. Man, I'm the opposite. I like playing in the original language, even if it means I have to read a lot. 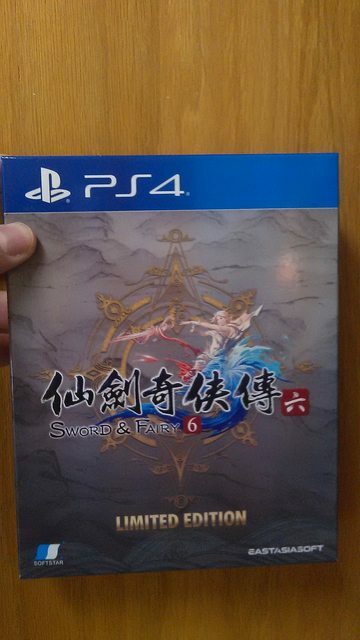 Anybody got a spare copy of sword and fairy? 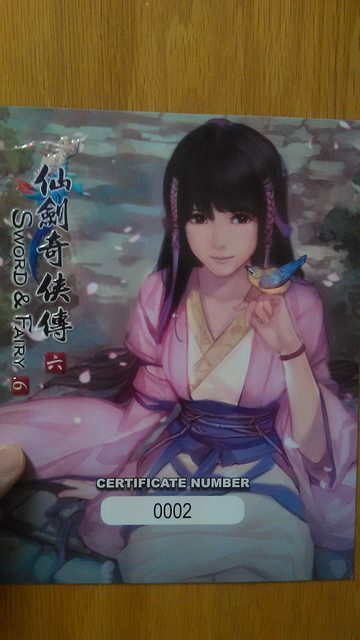 nosaveddata wrote: Anybody got a spare copy of sword and fairy? Shouldn't this be in trades? Yeah, you would probably have better chances posting it in the trades section, if only for new people looking for certain games who doesn't necessarily check all the topics.